Congratulations to our finalists and everybody who participated! 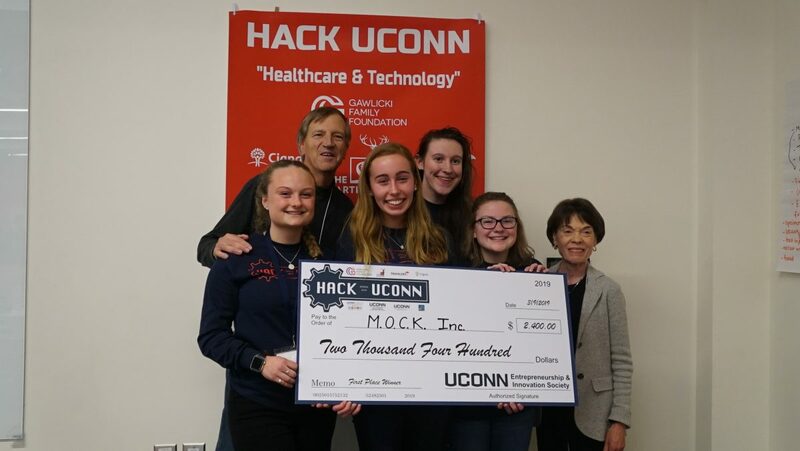 Our device focuses on the opioid epidemic and treatment of diabetic coma victims, created by Kiera Burns ’21 (ENG), Christina Bibinski ’22 (CLAS), Olivia Tirelli ’22 (CLAS) and Megan Walsh ’21 (ENG). The GDD 19x, the Glucose and Drug Detector, decreases treatment time by First Responders when arriving to the scene of an unconscious patient. Seconds can be the difference between life and death, thus EMS personnel need to be able to assess the situation and determine the form of medical treatment that unconscious patients require. The GDD 19x tells First Responders whether or not the patient is suffering from an opioid overdose or a diabetic coma by quickly scanning their blood, decreasing treatment time and avoiding nonessential Narcan administration. The GDD 19x not only increases the chance of patient survival, but aids EMS cost efficiency. The Pulmaphon introduces music in a very approachable yet intimate way. 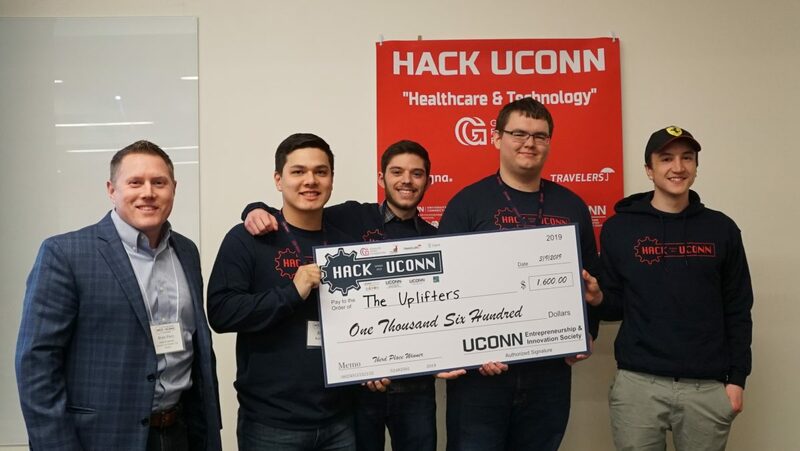 Gordon Markman (2021 Product Design) and Matthew Lombardo (2020 Management and Engineering for Manufacturing) are usually music partners. 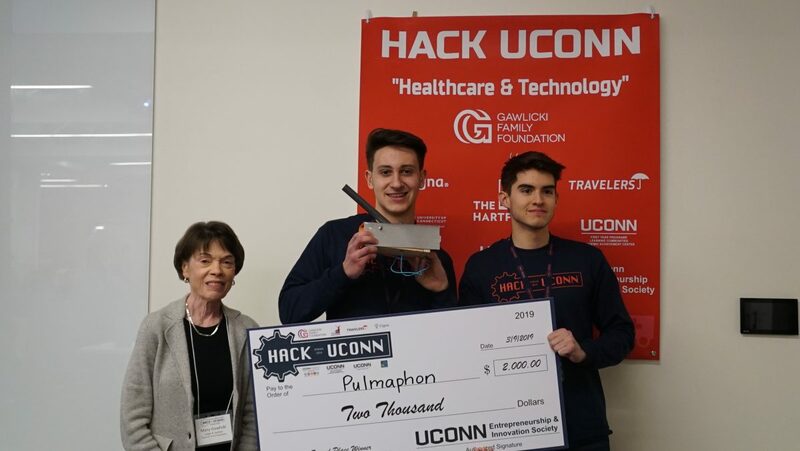 The Pulmaphon was started at UConn’s 2019 Hackathon by them after they recognized how people with lung issues such as COPD could greatly benefit from playing wind instruments. The problem is, wind instruments can be costly and frustrating, so the benefits are often not realized. With over 65 million people around the world suffering from moderate to severe COPD, the Pulmaphon hopes to redefine pulmonary therapy. Learning instruments can be hard. The Pulmaphon is easy. If you can breathe out, you can play it. The Pulmaphon is an instrument that is cheap, approachable, and therapeutic. Vibe is smartphone app that allows users to track their habits. It is aimed at people that are trying to stop a bad habit but it works just as well for people that are just trying to track their habits since there are always ways to improve a person’s everyday life. The innovative part of this app is the fact that it is a widget placed on your lock screen so that it does not require a lot of effort to track your habits throughout the day. It is fully customizable so that a person can chose what habits he/she wants to track. The widget also has an option to relate a habit to the way doing said habit makes the person feel. This leads to the 2nd part of the idea which is using machine learning and predictive modeling to help a person increase the overall satisfaction he gets throughout the day as well as to generate possible healthier alternatives. Vibes main goal is to help users with habit regulation with a holistic feedback approach. With Vibe’s widget ability, two clicks are all it takes to log an event. The first click is the activity (activities can be changed based on preference) and the second is the emotion felt by the user during that activity (happy, neutral, or sad). Even if used minimally (approx. 10-15 events a week), the user will get a personalized feedback report with habit recommendations that are as accurate a checkup. Accessible, accurate, and user-friendly healthcare. In terms of health complications, females often overlook symptoms that may be signs of preventable diseases. 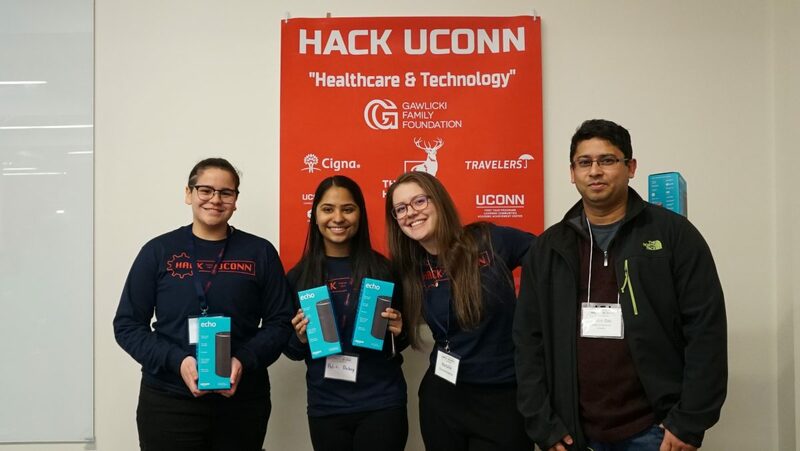 We created Preventable, a free, universally accessible app that allows individuals to track their health via their menstrual cycles and symptoms with the purpose of catching diseases early. The user enters their medical history and menstrual symptoms at their own convenience. Unlike other apps, Preventable uses this information to provide personalized feedback as a warning system for diseases, which can optionally be shared with their doctor. Catching and treating incurable diseases early, like Polycystic Ovary Syndrome, can prevent infertility, diabetes, heart disease, stroke, and other harmful conditions. In the future, Preventable will include a number of innovations, such as data from trusted medical sources and GPS to locate health centers. Surpassing individual differences, all humans come from a mother- this isn’t just a concern for women- it is a concern for everyone. Often times, after experiencing surgery, patients will be prescribed opioids to treat their pain. However, this can prove to be a medical issue in itself as these patients become susceptible to overdosing acquiring an addiction to opioids. Our innovation restricts patients from overdosing on opioids by providing the patient the suggested amount of the drug during the appropriate time. Our innovation will prevent people from overdosing or acquiring an addiction. In addition, our innovation secures the medication to make sure that only the prescribed individual has access to the opioids, this preventing misuse and resale by others. Well over 5% of the US population suffers from diabetes, a serious condition where blood sugar reach dangerous levels. Many struggles to comply with their treatment program of insulin shots and carbohydrate intake so we invented the stand-alone device SugarSeer. 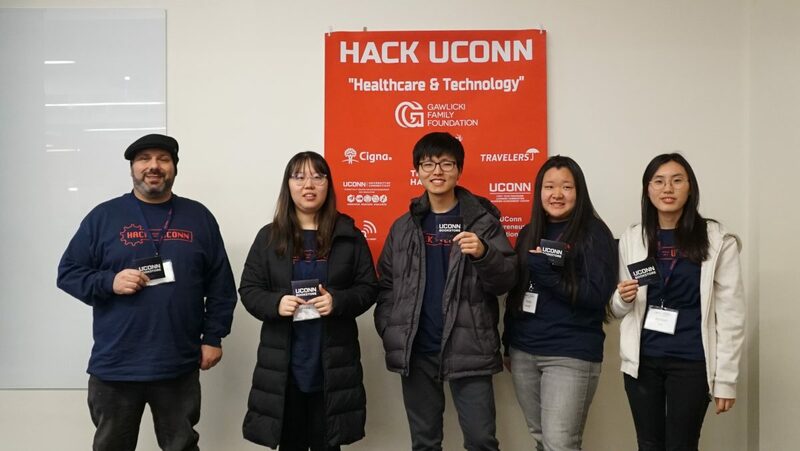 Using biosensors, it constantly measures a patient’s blood sugar levels and provides the data needed for medical providers and insurance companies to track and reward compliance. 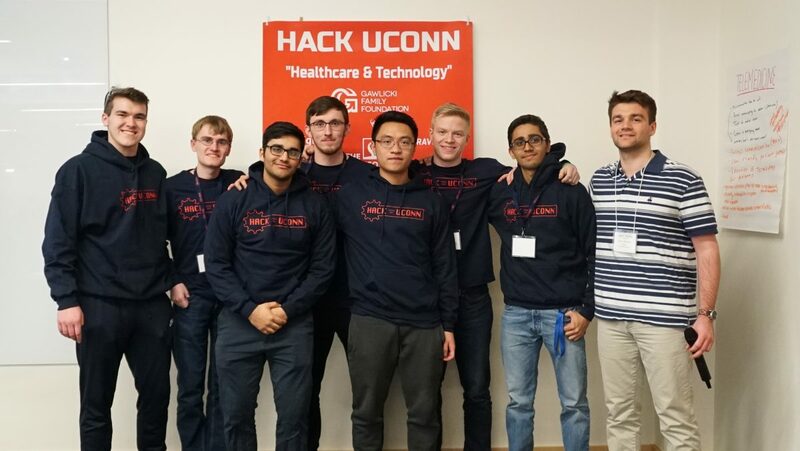 Using machine learning, SugarSeer alerts patients when they may need insulin injection of carbohydrate intakes. Many diabetics suffer from blindness so Sugar also uses vibrations, voice, and tactile clocks in its interface.